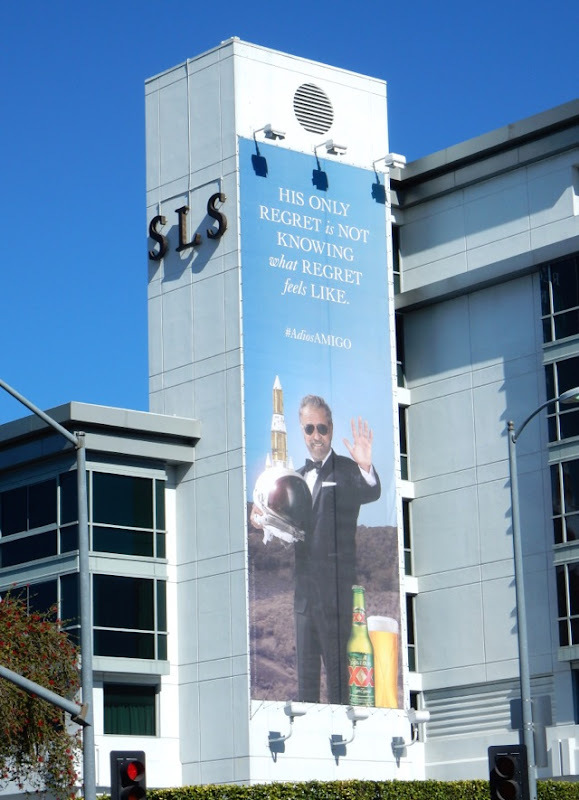 'The Most Interesting Man in the World' is back in the skies of L.A., and even though he was introduced as the fictional spokesman of Dos Equis back in 2006 by Euro RSCG he's still as charismatic all these years later. 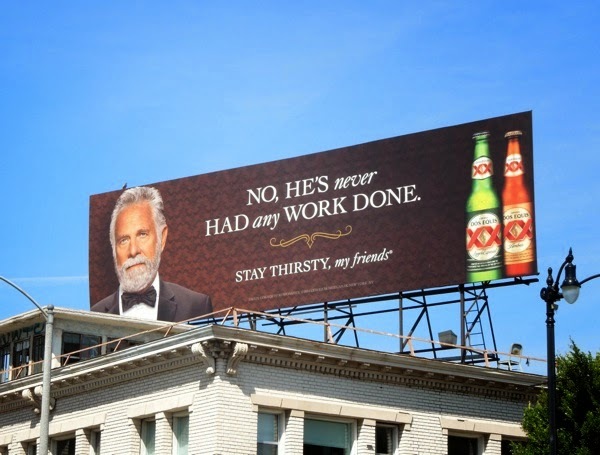 Now Jonathan Goldsmith is back as the debonair beer brand drinker in a whole new wave of ads for 2014, and just like George Clooney, this silver fox looks even better with age. There's always that question in the world of advertising, how long to do you keep using a slogan, concept or character before it gets tired or becomes no longer relevant. The answer is obviously as long as it keeps working for your brand. This sophisticated connoisseur has real staying power and is still as notorious, aspirational and interesting as ever. 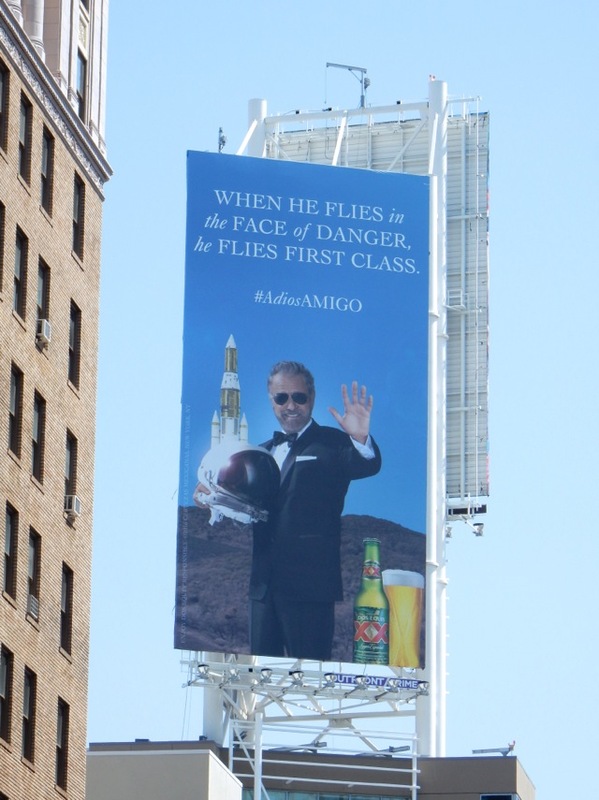 In addition to the most recent campaign, here's a selection of ads featuring the elegant spokesperson around the streets of Los Angeles from July 2013, May 2012 and April 2011 respectively. As you can see the design may have changes over time, but the spirit of the campaign is essentially the same over the years. 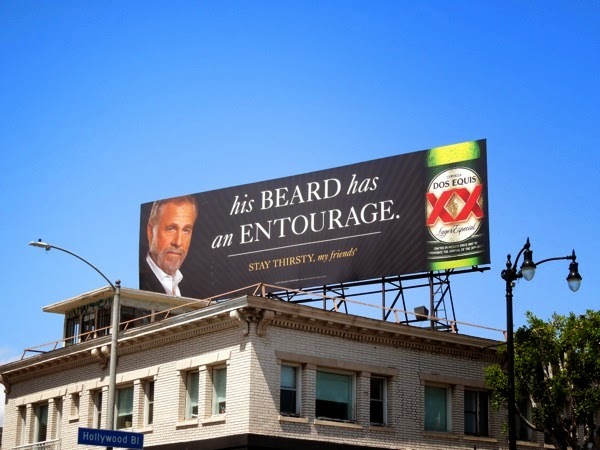 These new Dos Equis billboards were spied along Sunset Boulevard and Hollywood Boulevard on April 3, 2014. 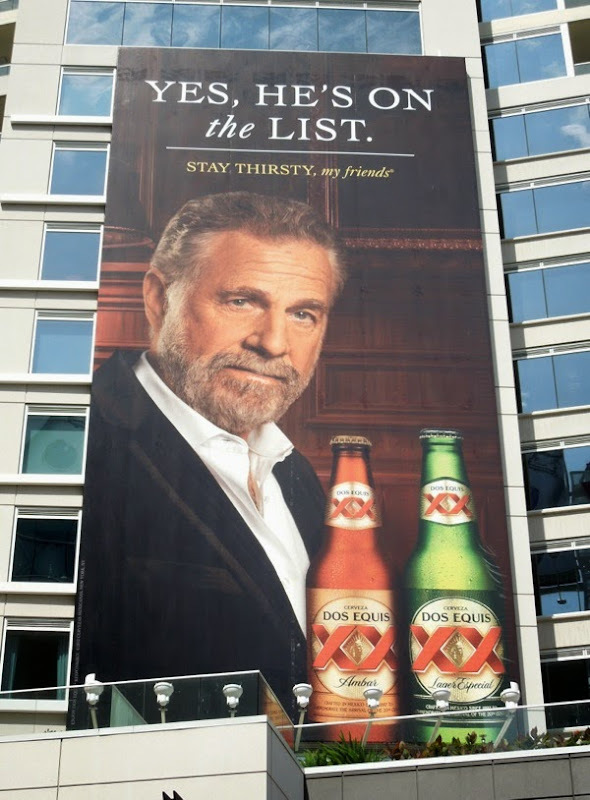 Now that 'The Most Interesting Man in the World' has joined the ranks of such iconic brand characters as the Old Spice guy, the Jolly Green Giant, the Energizer Bunny and even Coke's Santa, how long will his legacy last? 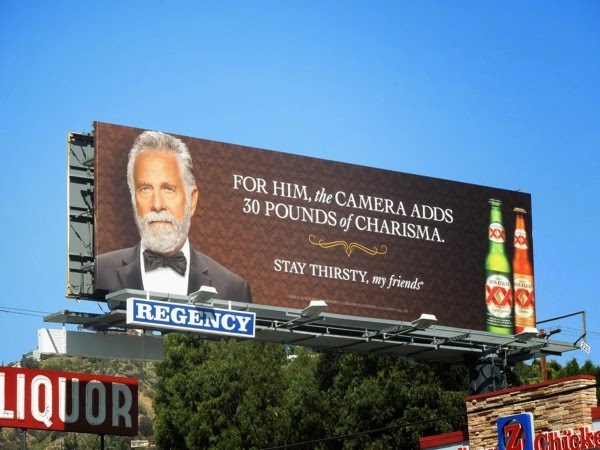 For now the worldly gentleman's appeal still has beer flying off the shelves, so as the wise man says, "Stay thirsty, my friends". 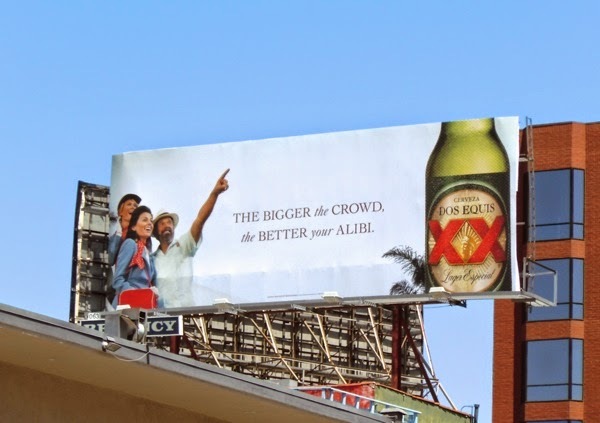 UPDATED: Here's another wry billboard ad in the new Dos Equis campaign spied high above San Vicente Boulevard near Wilshire Boulevard on April 16, 2014. 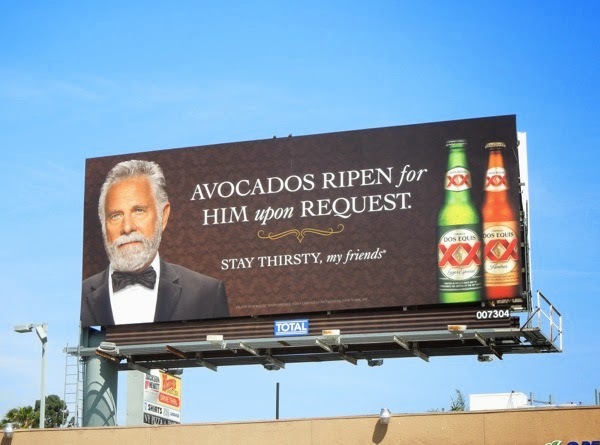 Enjoy responsibly. 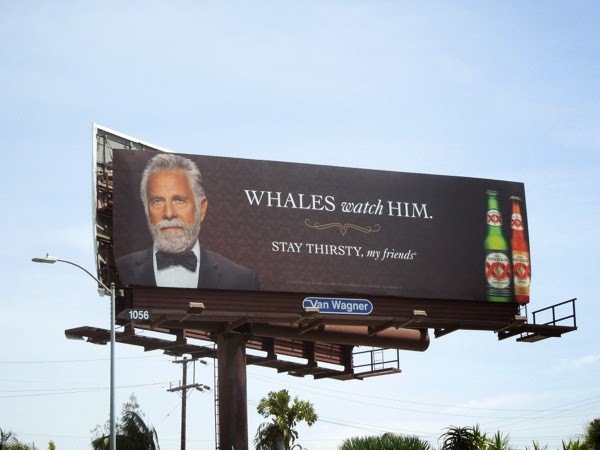 UPDATED: Plus another ad creative suggesting he's so enigmatic a man that even whales watch him. 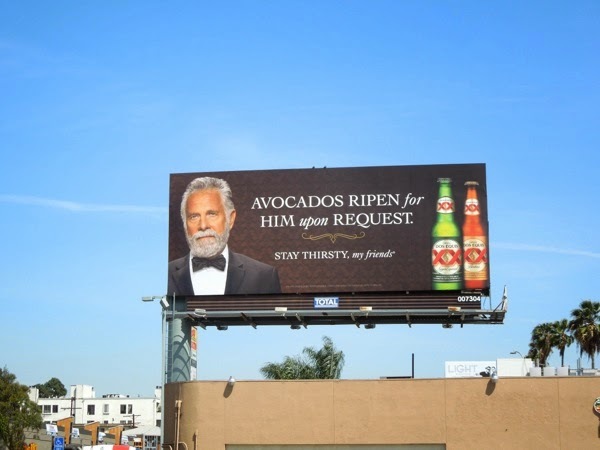 This billboard was spotted at the intersection of Santa Monica Boulevard and La Brea Avenue on April 23, 2014. 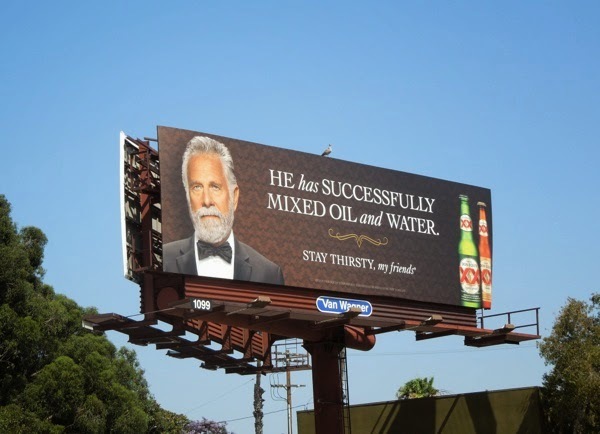 UPDATED: The remarkable feats of this most interesting individual keep coming as this latest billboard spotted along Venice Boulevard on May 25, 2014, attests he can successfully mix water and oil. 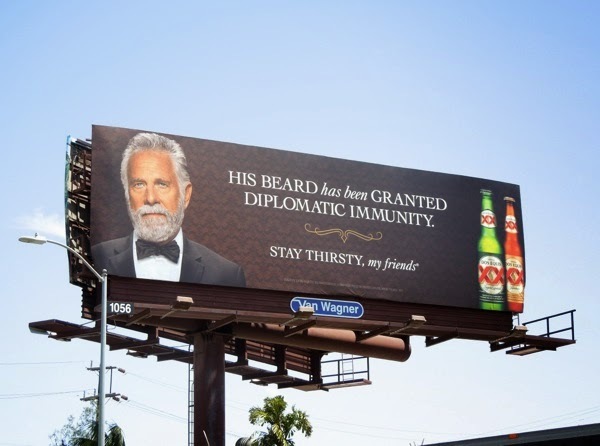 Plus here's another creative replacing the 'whales' version and this 'his beard has been granted diplomatic immunity' ad was snapped along Santa Monica Boulevard on June 4, 2014. 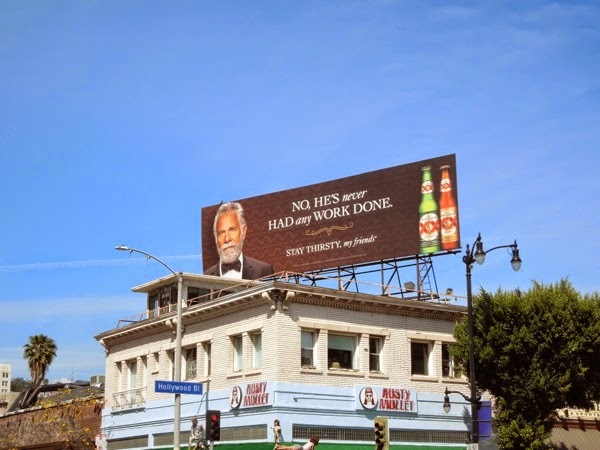 The copy writers certainly must have a fun time coming up with all these iterations of this campaign, but maybe a Dos Equis or two helps with the creative process. 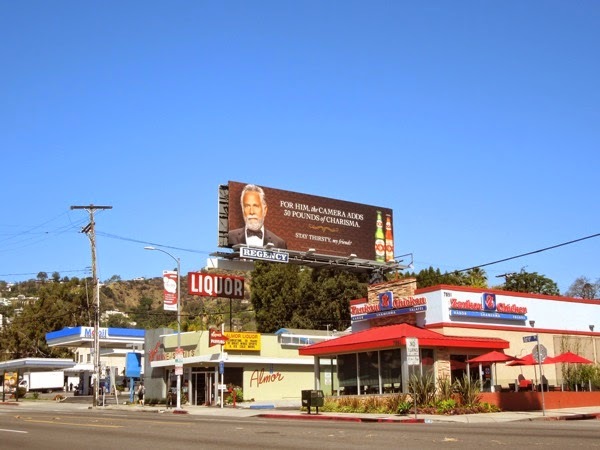 Meanwhile another new billboard has appeared high in the skies along San Vicente Boulevard. 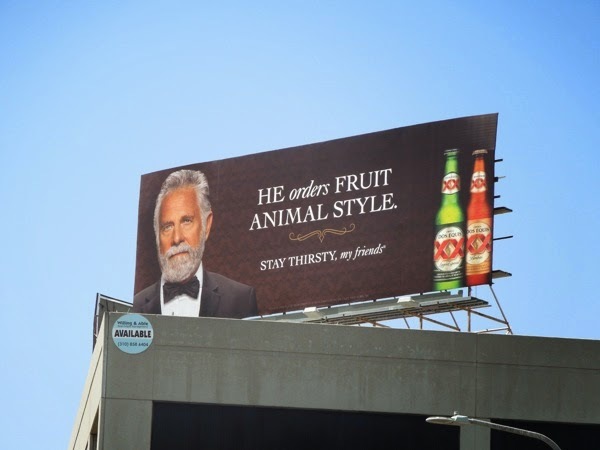 In this one snapped on June 9, 2014 apparently 'he orders fruit animal style' - is that with the skin on, in huge quantities, not quite sure. Or does it just mean he's a magnificent beast. 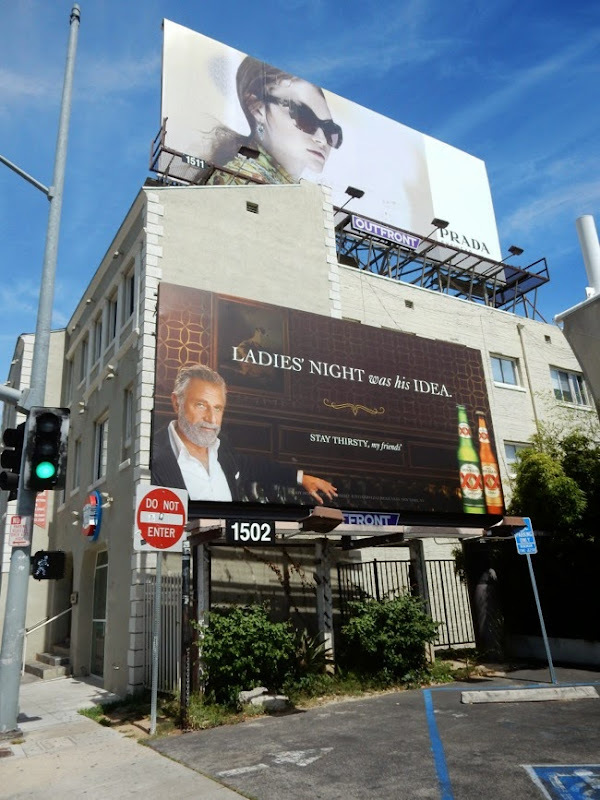 UPDATED: The Most Interesting Man is back in the skies of L.A. in 2015 with this smaller 'Ladies night' ad creative, spotted along the Sunset Strip on April 29, 2015. 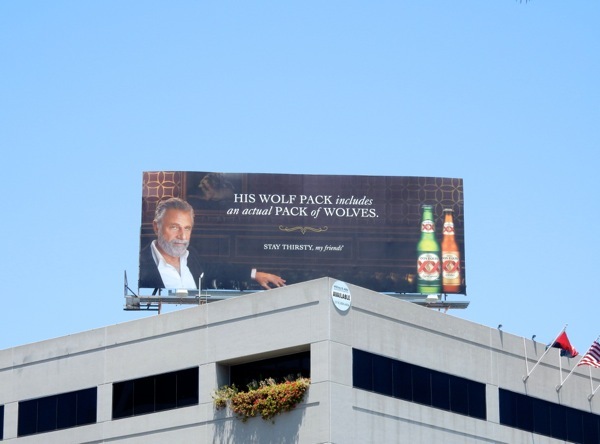 UPDATED: The laid-back enigmatic charmer is back in the skies of San Vicente Boulevard with this witty 'wolf pack' creative snapped on June 15, 2015. 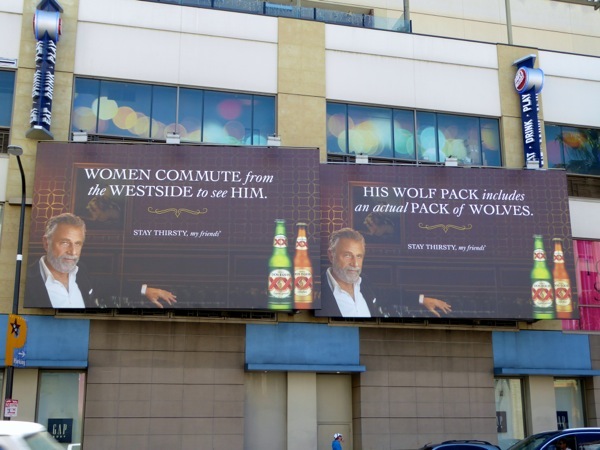 UPDATED: Here's a duo of billboards for Dos Equis snapped along Highland Avenue on August 15, 2015, one the 'wolf pack' version, the other 'Women commute from the Westside to see him'. 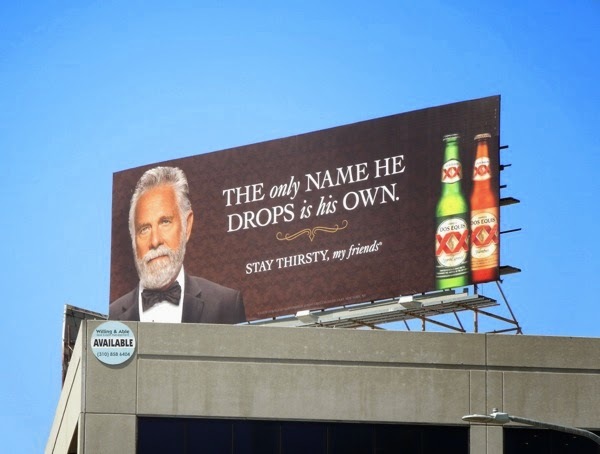 UPDATED: It's the end of an era for the face of Dos Equis, as the beer brand is retiring their Most Interesting Man in the World, but not before he goes on one last adventure. 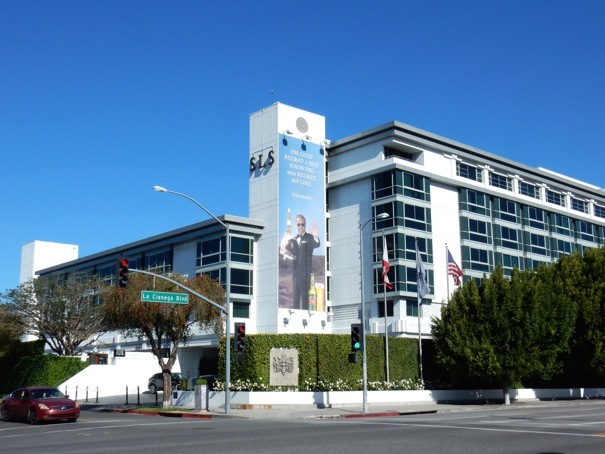 This out-of-this-world billboard was snapped along La Cienega Boulevard on the side of the SLS Hotel on April 16, 2016. It's been fun, but there's really no regrets. Adios amigo! Plus here's also another farewell creative high above Vine Street in Hollywood on May 1, 2016.